To accept Life for what it is does not mean inaction. It means deep, purposeful, insightful action. Once you understand the transient, impermanent nature of everything, including this “given” Life of yours, you will realize that acting with acceptance is the only intelligent way to live this lifetime – fully, happily! When we are merely responding to Life’s various events, we are actually reacting. This reacting leaves us disturbed and often agonized. But when we are responding with insight, we are flowing with Life – while doing our best in whatever circumstance we find ourselves. A farmer lived with his family in Jaffna, in northern Sri Lanka. Over the two decades of civil war and strife that his country, and particularly his village, witnessed, the farmer lost everything. He lost all his family members in the civil war. The Tamil guerrillas who controlled that part of the country usurped his farmland and converted it into a camp for recruiting innocent children and teenagers into their ranks. The farmer, obviously beaten and devastated by his losses and the violent environment that he was forced to live in, was advised by several people to run away, to escape to Tamil Nadu, or to seek refuge elsewhere. Those who advised him made good their escape from the village whenever an opportunity arose. But the farmer stayed on. One of his responsibilities was to clean a temple that had been built by his forefathers centuries ago. In every generation that preceded him, a member of his family had cleaned the temple, washed the deity and prepared the sanctum sanctorum for the village priest to come and perform the daily rituals. The farmer was the custodian for this task from his generation and he went about this diligently. 8 years ago, the village priest was killed in a cross-fire between the Sinhalese army and the Tamil guerrillas. Ever since, the farmer performed the daily rituals himself. Finally, when the guerrillas were overthrown a couple of years ago, a Buddhist reformist group arrived in the village to help rebuild it and to rehabilitate its residents. No one can control Life. Life and death are two sides of the same coin. So, any attempt to control Life means to have the ability to control death. Which none of us can. 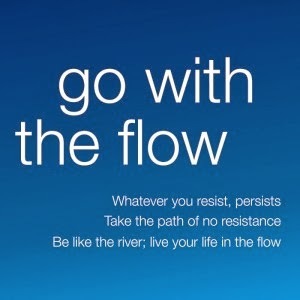 So, instead of thinking of controlling Life, if we can flow in acceptance, we will have found the way to live in peace. Flowing in acceptance means to surrender yourself to the cosmic design. So, surrender, and wear the Life it weaves for you on your sleeve!